As I said at the end of last week’s reading… what else is there for Hargis to learn about himself? Let’s answer that question. Saddened by this desertion, I resumed my journey, once again finding the going rough through the narrow rock confines connecting them. Somehow, I was not surprised to see someone straddling the pathway in the middle of the next lea. This was a sturdy youth of my own age, and his stance held a measure of menace. I tightened my hold on my hickory staff as we met. We examined one another in silence for a few moments. He was fully as broad as I and of a height. His jerkin was open, giving a glimpse of heavy muscles. Here was a formidable young man. And handsome, too, I noted with surprise. Such things were normally beyond my ken. He bore a resemblance to Donneth, yet without his soft ways. Abruptly, I closed my mouth, stymied for an answer. “Ask him,” I finally said. The words sounded weak. I stood silent, unable to admit what had happened. He paused to allow me to shed my pack and my doublet. His eyes raked my chest and shoulders, measuring his opponent. Then he closed on me suddenly. I met him confidently. The quarry is a hard way to earn a living, but it provides certain advantages. Daily, I had moved masses of rock for four long years. I was as hard as one of those stones and as strong as any man I’d ever known. But somehow in these mountains, Ayeth had found his own source of strength. We grunted and groaned, swaying in the middle of the path, each seeking to throw the other. Finally, he managed to fling me against a tree. Instantly, he was upon me, but I moved aside and fastened myself to his back like a tick on a dog. We rolled on the ground until he dislodged me. I do not know how long we battled, but it was long enough to weaken me. His attacks seemed less vigorous, but then so did mine. At length, we fell to the ground again with him atop me. I felt the strength go out of him. He lay inert, his long form flowing down the length of me. I stopped my own struggles; we lay face-to-face, sweating and panting. His brown eyes studied me for a moment before he lowered his lips to mine. Surprised, I permitted his intimacy. “You want me, Hargis. Admit it,” he gasped. “Then it will be on my terms.” He recovered faster than I. “Aye. On your terms.” An eagerness seized me that left me weaker than my struggles. He stood, swayed for a moment, and then steadied himself, legs apart, hands on his hips. I rose to my knees and reached for him. He stayed me with a hand on my head. Besotted, I nodded agreement. We ate of roasted pig in easy companionship, although we spoke little. As for me, my mind was taken with seeking answers to profound questions about my actions since entering this strange place. What had happened to me? Why had I acted as a man for one man and accepted another? As evening arrived, it became clear that I would remain the night. We cleaned ourselves in silence before retiring. He seemed absolutely placid; however, I was skittish as a newborn colt. And in a sense, I had been reborn. When we finished, he turned to me. “I will return shortly.” With those words, he was gone. I had begun to contemplate desertion before he reappeared out of the darkness lugging a bundle of hides. “What is that?” I asked in relief. There was leather to supply me for several lunations. I would not starve when I arrived at Dag Durgess. “Are you certain?” At my nod, came to me as no man had ever approached me before this time. His searching kiss addled my mind as he lowered me to the blanket. His hard, muscled body covered mine. That he did, driving me crazy with new feelings, new sensations, new desires. He exhausted me more thoroughly than had our struggle on the trail. And the force of our exertions left us exhausted and draped over one another. His heart thudded against mine as our breathing eased gradually. “Would you stay with me?” he asked calmly. He spoke the truth. Totally exhausted, I lay in his comforting arms through the depths of the night. In the quiet of the darkness, I thought back over my three days in this mountain. Magically, I slept. On the morrow, there was no sign of Ayeth’s existence. I would have doubted it myself, save for vivid mental images of our coupling. The rest of the trail out of the mountains was as easy as had been the entry. I emerged onto the foothills and viewed a broad plain that led down to a blue sea. 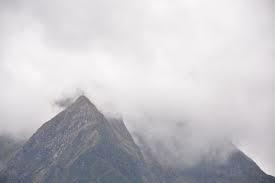 I turned to look back at the mountain, once again made hazy by a thick mist. The trail was real; the mountain was a solid substance. Yet I doubted that many who took this way walked the same mountain I had crossed. My true nature suddenly clear in my own mind for the first time in twenty summers, I gave silent thanks to four, fair supernatural beings as the worm of uncertainty departed my chest, leaving me free of disquiet for the first time in ages. Refreshed and filled with a new resolve, I and turned east with firm footsteps toward my goal. To Dag Durgess where Dirkston anticipated my arrival before the Festival of the Harvest Moon. And now Hargis knows his true nature. His life in Dag Durgess is apt to be quite different from the one he led in Rodenbury. But he should be far happier understanding himself and his desires. Good luck to him.